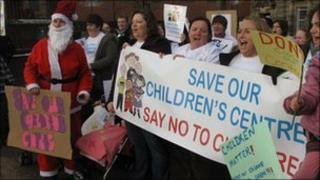 A petition signed by 6,500 people against plans to close some of Stoke-on-Trent's children's centres has been handed in. The city council has proposed closing seven of its 16 Sure Start centres as part of wider plans to save £33m. The petition was handed in at the Civic Centre and received by Mohammed Pervez, the Labour council leader. The authority has said it does not want to close the centres but has to make cuts. The petition was handed in by about 30 people. Campaigners were lobbying the last full council meeting before Christmas. Melissa Beydilli, from the new Save our Children's Centres campaign, said: "People are devastated. "I've had people crying on radio stations this morning, because they don't think they can cope if their children's centre is taken away." Mr Pervez said: "We're listening loud and clear. "Children's centres we knew were going to be very important to people and this is clear evidence that we were right. "People are really genuinely concerned about losing children's centres and we have to take that on board now." Final decisions will not be made until early next year. Unions opposed to public sector job cuts and students against plans to raise tuition fees joined protests outside the Civic Centre. The council is run by a coalition led by the Labour group.